Right after doing an interview with the fascinating author, Sandra Champlain, who wrote the bestseller, “We Do Not Die,” I confirmed this theory by visiting Gettysburg soon after speaking with her. When you have time, please do check out her radio show, We Do Not Die, at www.sandrachamplain.com/radio. On Wednesday, March 16, I flew from Savannah, GA to Washington D.C. to meet up with my friend Jim, who was going to show me around Gettysburg. Having several ancestors who fought in the Civil War, some surviving, Jim has an affinity for the place and made a great tour guide! My friend Tamara Springer Gleason, who is a psychic/medium, Reiki Master, hypnotherapist teamed up with Robb Demarest, formerly of Ghost Hunters International and Haunted Australia, and together they investigated the inside of one of Gettysburg’s largest Civil War Field Hospitals. The Battlefield Brew Works on the historic Monfort Farm property, where over 450 confederate soldiers lost their lives on the floor of that building. Used as a field hospital, walking on blood stained floors, both nights they had people tripped and scratched my unseen forces. My friend Jim and I met up with them On St. Patty’s Day at the Gary Owen, where we spent the holiday evening at a fine Irish establishment. Featuring live music, traditional Irish dishes and too many beers to choose from, it was the perfect way to celebrate given that Gettysburg hosts a monument to the Irish Brigade that fought in the Civil War. The following day we spent the afternoon walking up to the top of Big Round Top to get a view of Little Round Top, including Devil’s Den and the Valley of Death. From July 1-3, 1863, Union and Confederate troops faced off and after a three day massacre, there lay over 50,000 bodies across a blood soaked field. The more I walked up the hill, peering over the rocks, I had the feeling that I had been hit in the stomach. After a while I couldn’t breathe well, and I could taste blood in my mouth. After two hours, I had had enough of absorbing the unimaginable pain those soldiers had suffered. Before heading back to town, we drove over to Spangler’s Spring where there was yet another massacre. Oddly after only one other car driving through, we were there alone as the sun was going down. As I walked a road bordered by thick trees, I picked up on a young soldier that wanted to go home. I could tell what he was saying, as I often do, and with an unforgettable sadness, he asked me to help him go home. When I studied the Civil War in middle school, I had nightmares about losing a son in the war. I wonder if this young man who needed help knew me on some level. I told him to ask for his spirit guides and guardian angels to light the way home, where he would be welcomed by his loved ones. It was quite emotional, and I got tears in my eyes. My friend Jim leaned over to touch the back of my neck, and he jumped backwards. Apparently when he went to touch me, he received a shock like “putting his hand into barbed wire.” That validated to me that I really was talking to someone whose energy was surrounding me. I’d like to think we helped him find his way home. The next we drove out to Sachs covered bridge where Confederate soldiers hung their deserters. Jim walked into the bridge on a cloudy rainy day, and there is a shot of the bridge where it looks like there is a skylight because a stream of light was shining in through the top of the roof. This anomaly didn’t compare to what happened the night before while staying at the Farnsworth House. Friday night we had two rooms booked and planned on eating dinner before checking in. Immediately after dinner, we were taken on a ghost tour of the building. The Farnsworth House was built approximately in the year 1810. The first owner being John McFarlane. 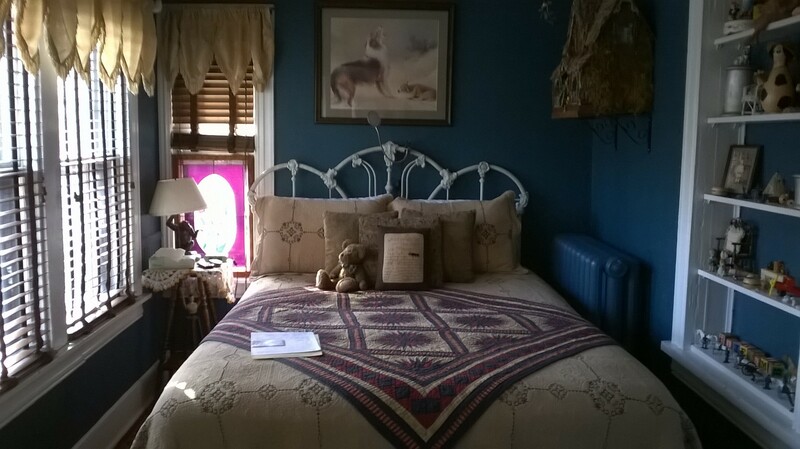 Turned into a Bed and Breakfast in 1986, the house is purported to be haunted, very haunted! After dinner we took the Ghost Tour through all three levels of the Farnsworth Inn. The basement was were many bodies were stored before they could be properly buried. The common activity throughout the house are children playing, soldiers walking across the attic floor at night, and a previous owner, Mr. Sweeney, who doesn’t care for visitors in his house. Jim had the pleasure of staying in the Sarah Black room, where you can sometimes smell her perfume. We certainly did when we first walked into the room that afternoon. Earlier in the evening, during our ghost tour, it was said that snipers used the attic of the Farnsworth Inn and the shot that killed Jenny Wade, the only civilian killed in the Battle of Gettysburg, reportedly came from the attic window. Now late at night, you can hear footsteps across the ceiling, coming from the attic. Unmistakable boots pacing the floor was captured by my friend’s digital recorder. He also felt a presence of someone at the foot of the bed, which kept him awake most of the night. That particular specter could be Jeremy’s father, a boy who died where the bathroom is now in that room. He died in his father’s arms and has been known to move things, play with cell phones and can be heard laughing in the halls. I stayed in Jeremy’s room, which used to be an open air porch where two Confederate soldiers were shot to death, one almost being decapitated by a bullet. The room now is dedicated to Jeremy, boasting blue walls and lots of toys to play with. Yet an eerie feeling that you are not alone. I literally slept like a baby in Jeremy’s room, although I was woken up by a boy and a girl running through the halls, laughing and slamming doors. I later found out there were no children checked into the Inn that day. I had taken pictures of the book shelf full of toys when I checked in. As I got ready to leave, I noticed three toy soldiers had fallen over, although I couldn’t explain how they had done it on their own. I thanked Jeremy for letting me enjoy his room, and was thankful my night at a haunted inn was over. My friend didn’t share my enthusiasm after being kept up all night with boot steps, a freezing room and a figure moving around at the end of the bed. Going to Gettysburg was an honor and has to be seen to truly be appreciated for what this country went through for freedom and equal rights. It’s like stepping back in time and the profound impact of so many deaths hangs in the air, still to this day. Next Next post: Big & Rich-They are comin’ to your city! Hi Susan, I am a regular listener to Sandra’s shows, and while most of her shows are exceptional, hearing you telling your story there was really a cut above the rest. Thanks for that. I am a Gaia-subscriber, and have just seen you on GN’s show too. I am out of words for your story, your son’s story, and that of Cody, and the things you stir up in me (and probably many others too). So I looked up your web and as you announced on Sandra’s show, lo and behold, I find a story in your words about your travel to Gettysburg. For the record: While not being from the US (in this lifetime at least), I have always had a strong wanting to learn about the US civil war. I can hardly put into words how I sometimes crave information about this seemingly weird subject. I devour anything, from he sheer violence, masses going straight into bullets, to politics and the reasons for the civil war, to the consequences it had for your society as a whole.- And more. But above all, the battle of Gettysburg stands out. I thank you very much for this address, as it gave me some strange sense to something I don’t really know what is … unless I do. It tells me that spirit does not know time, nor space. Thank you so much for your letter, and I apologize for taking so long to reply. I am so happy to hear that you enjoyed my interview with Sandra and saw me on George Noory’s Beyond Belief. They are both such a pleasure to talk to. 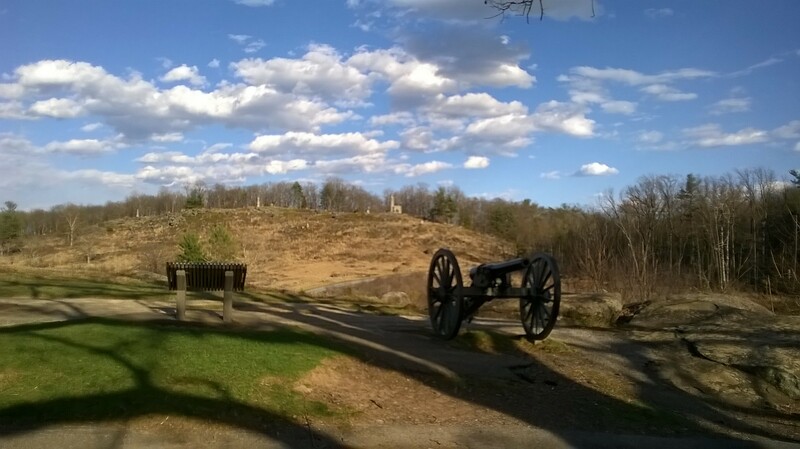 NOT ONLY ‘ GETTYSBURG ‘ BUT ‘ VICKSBURG ‘ AS WELL , ESPECIALLY IF YOU WATCH THE TRAVEL CHANNEL ! THESE LOST SOULS HAUNTING THESE PLACES ARE ALL OVER THE PLACE CALLING OUT FOR HELP BECAUSE THEY’RE STUCK HERE AND SOME OF THEM AREN’T EVEN AWARE THEIR DEAD , TO BOOT ! EVEN THOUGH WE HAVE THE TECHNOLOGIES OF E.V.P.’S AND OTHER GOOD STUFF TO COMMUNICATE WITH THEM , IT’S ALL IN VAIN BECAUSE WE DON’T REALLY KNOW HOW TO HELP THEM TO LEAVE THIS PLANE OR WHAT TO TELL THEM TO LOOK FOR TO SHOW THEM THE WAY TO MOVE ON , BECAUSE WE DON’T KNOW OURSELVES THE COMPLETE PICTURE ! THERE IS ALSO ANOTHER FACTOR THAT COMPLICATES MATTERS FURTHER , APPARENTLY THERE ARE IN SOME CASES WHERE A CONTROLLING OR THREATENING ‘ DEAMON ‘ IS PRESENT FURTHER PREVENTING THESE SOULS FROM MOVING ON . STANLEY KUBRICK IN HIS FILM ‘ THE SHINNING ‘ DRAMATICALLY BROUGHT THIS PROBLEM TO THE ATTENTION OF THE PUBLIC , WITH TRAGIC ENDING MOVIE RESULTS INVOLVING NOT ONLY ADULTS BUT CHILDREN AS WELL . I DON’T KNOW WHAT THE ANSWERS ARE TO GET HELP TO THESE SOULS CAUGH UP IN A ‘ LIFE LOOP ‘ BUT HOPEFULLY SOMEONE OUT THERE WILL . Hello Laura, I didn’t get a chance to talk about what is happening in Gettysburg, and you’re right, these souls are not getting a chance to rest in peace. Especially the reenactment every year of one of the bloodiest battles our country has ever experienced. Included in my book is my encounter with a soldier while I was walking in the fields that day. He rushed at me from the trees and begged me to help him go home. I hope I helped him that day, and I pray at some point, the lost souls from the Civil War can finally let go and find their way home, as well.